Katja Haecker of Sweet & Salzig makes her mother’s favorite cookie, fruitcake-like Basler Läckerli, but with her own twist this holiday season. If you email Katja Haecker in the morning, she’s probably baking. If you text Katja Haecker in the afternoon, she’s probably still baking. And you’re best not to disturb her. 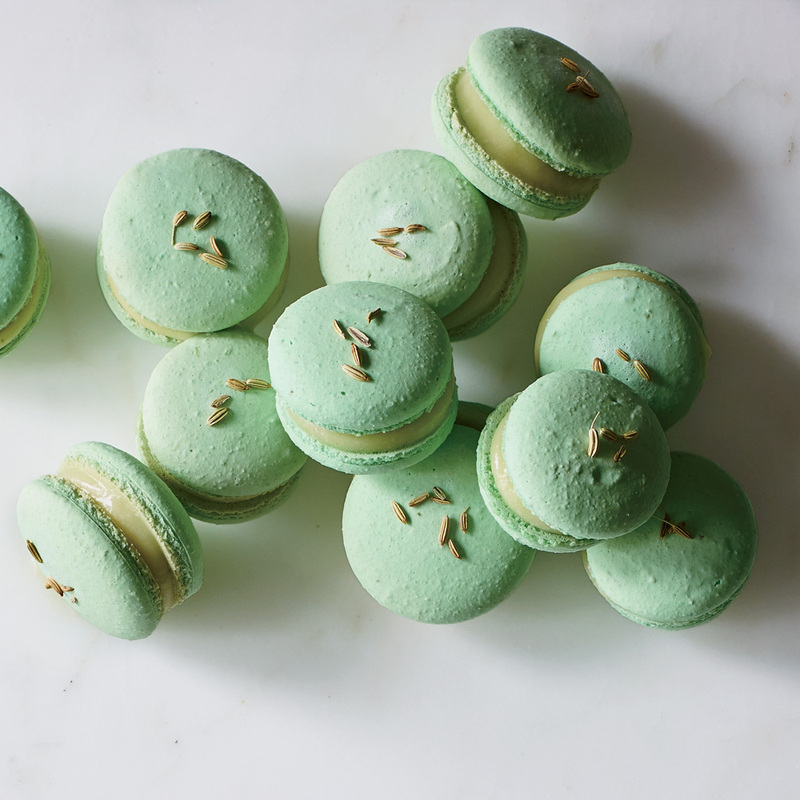 Because in a kitchen based out of Pilotworks in Brooklyn, an old Pfizer complex turned food incubator, Haecker is making a little Christmas magic in the form of Basler Läckerli. Läckerli is the almost like the fruitcake’s cookie cousin. 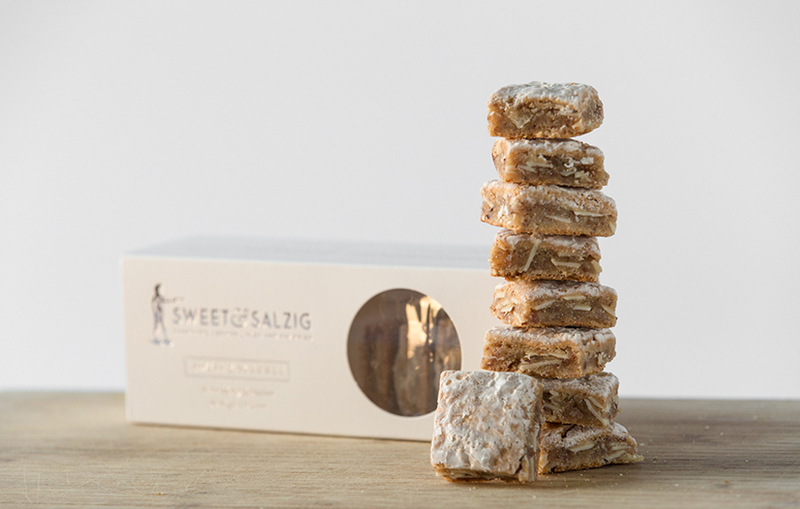 Originating from Basel, Switzerland, the dense, chewy biscuit is made with honey, candied peels, a touch of kirsch and lots of nuts (hazelnuts and almonds). As a kid growing up in Baden-Wurttemberg, Germany, Haecker and her family drove two to three hours into Switzerland to get their favorite läckerli. Her mother loved them. However, these treks couldn’t keep up with demand, so Haecker’s mother started making them herself. The German expat continues that tradition in her new home, and just like mom made them. She searched for Black Forest area products, like honey (raw organic honey subbed nicely) and kirsch (procured but pricey). She relies on her mom’s mix of citrus peels—only lemon and orange. But the recipe is all her own. Haecker played with the spices—her own secret mix—and instead of just pouring the kirsch into the dough mix, she also spackles a kirsch-powered glaze on the cookies hot out of the oven. It took some convincing initially to get Haecker into the baking business. She first came to New York City to work in advertising. After leaving the industry on a full-time basis, she stayed in the city and friends kept pushing her to do her own thing after trying all the cakes she’d bring to dinner parties. Finally, after one very persistent fried invited her to cater an event for a Germany company and introduced her to other bakers and food incubators, Haecker succumbed and, two years ago, Sweet & Salzig was born. Now, she’s made a name for her stollen (inspired by her grandmother and a friend’s grandmother’s recipe), sauerkraut cake and, of course, läckerli, which can still be ordered for last-minute gift givers until December 20. Haecker’s working on getting her savory cakes into freezers at stores across the country and musing over a possible cookbook. But right now, it’s all about these Christmas treats. And back into the kitchen, dusted in flour and sticky with kirsch, she goes.